So I bought this Casio model on a Walmart flash sale for like $30 that came over my phone one night while my defenses were down. Once I got it I figured it would be relegated to weekend beater or box chump. First thing I did was to change the stock silicone band for a leather Barton band which is beyond comfortable. The date window on this model is uber dinky so I glued on a cyclops from Esslinger. My first mod and, yes Blubba, it is slightly off. Now I am seriously in like with this watch and it is a regular in my lineup now. 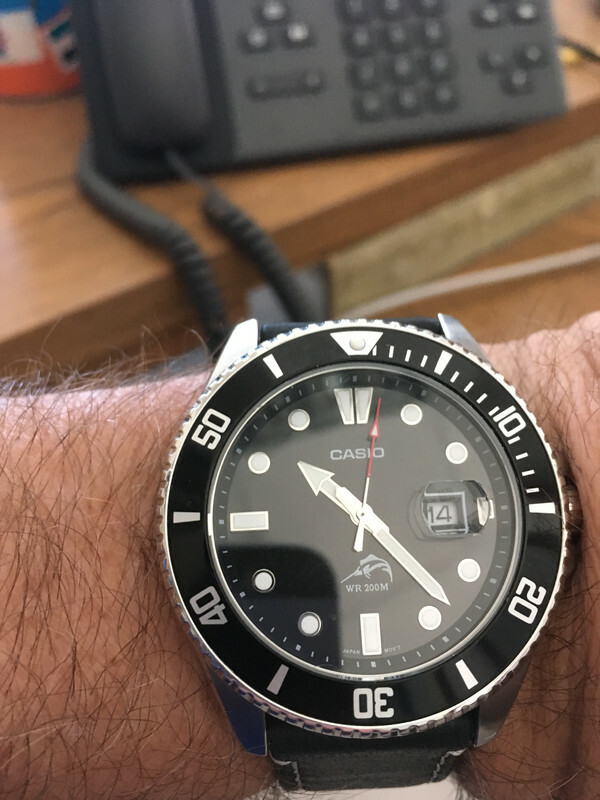 I think it has classic good looks for a diver, and the lume is reasonable (even on the seconds hand). Also impressive is the accuracy of this watch. I last set it on July 13 and since that time it has lost 53 seconds. For a $30 watch that is pretty descent, at least in my book. I bought a couple of these for my boys one year. They are nice for the money. But isn’t this a quartz? 50 something seconds in a couple of months is not that good for quartz. Should be within a couple of seconds per month. Sent from my satellite phone.